We'll be talking about how to build true wealth, with a special focus on one of its most valuable forms: a healthy & capable body. Chris and Adam will share their latest forecasts on the world macro situation -- economic & financial dangers, resource depletion, energy system instability -- as well as insights from their upcoming book on how to best insulate ourselves from these risks. 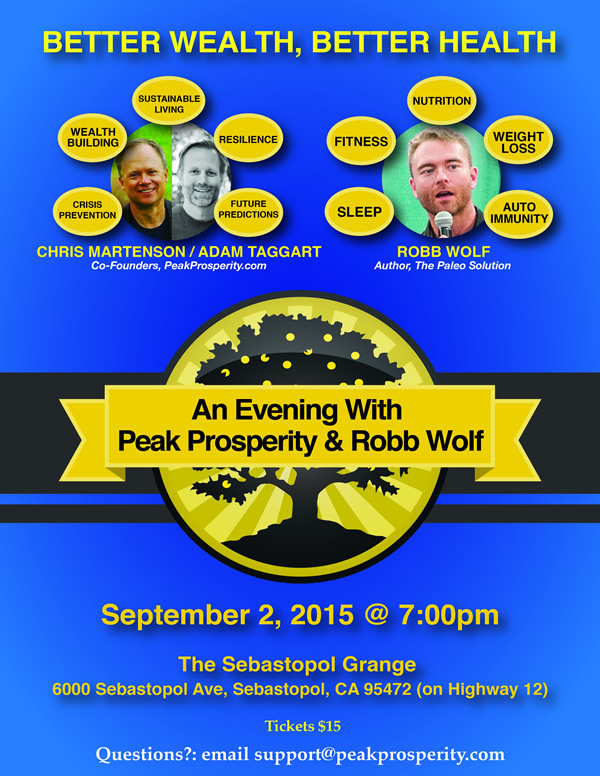 Robb will share the latest learnings from his vast expertise in nutrition and fitness, focusing on the best behaviors to adopt today for entering the coming future with the highest degree of health and physical aptitude possible. For those unfamiliar with Robb, he was involved with the development of two immensely successful movements: the Paleo diet and the CrossFit fitness regime. He's a true leading expert in the field of functional health and has been a long-time member of Peak Prosperity. We're thrilled he is making himself available to join us. Details for the speaking event are below. Tickets for the general speaking event, which is from 7-9pm will be $15 per person at the door. If you'd like to ensure your seat against the risk of the venue selling out (which it did the last time we presented), you can click here to pay for your ticket(s) in advance. Just enter $15 as the amount, and then your credit card info when prompted. inspired by our recent podcast, several folks coming into town have asked if we could set up a tour at Singing Frogs Farm. We've been able to arrange one at 9am on Thursday, September 3. The group size is limited to 25 people. If you'd like to join, email us here. At our invitation, permaculture expert and author of Gaia's Garden, Toby Hemenway, will participate in the Singing Frogs Tour and has agreed to make himself available for coffee in downtown Sebastopol afterwards at 10:30am. If you'd like to be among those who join him, email us here. As you can see, this is turning into quite a convergence of the Peak Prosperity community. We hope you can be part of it!